^ Huang, Taosheng; Atwal, Paldeep S.; Wong, Lee-Jun; Fan, Pi-Chuan; Hwu, Wuh-Liang; Chien, Yin-Hsiu; Chen, Stella Maris; Brown, Jenice; Dell, Sarah (2018-12-18). "Biparental Inheritance of Mitochondrial DNA in Humans". Proceedings of the National Academy of Sciences. 115 (51): 13039–13044. doi:10.1073/pnas.1810946115. ISSN 0027-8424. PMC 6304937. PMID 30478036. ^ Boursot, P.; Bonhomme, F. (1986-01-01). "Génétique et évolution du génome mitochondrial des Métazoaires". Génétique, Sélection, évolution. 18 (1): 73–98. doi:10.1186/1297-9686-18-1-73. ISSN 1297-9686. PMC 2713894. PMID 22879234. ^ Delsuc, Frédéric; Stanhope, Michael J.; Douzery, Emmanuel J. P. (2003-08-01). "Molecular systematics of armadillos (Xenarthra, Dasypodidae): contribution of maximum likelihood and Bayesian analyses of mitochondrial and nuclear genes". Molecular Phylogenetics and Evolution. 28 (2): 261–75. doi:10.1016/s1055-7903(03)00111-8. ISSN 1055-7903. PMID 12878463. ^ Hassanin, Alexandre; An, Junghwa; Ropiquet, Anne; Nguyen, Trung Thanh; Couloux, Arnaud (2013-03-01). "Combining multiple autosomal introns for studying shallow phylogeny and taxonomy of Laurasiatherian mammals: Application to the tribe Bovini (Cetartiodactyla, Bovidae)". Molecular Phylogenetics and Evolution. 66 (3): 766–75. doi:10.1016/j.ympev.2012.11.003. ISSN 1095-9513. PMID 23159894. ^ "Hiring a DNA Testing Company Genealogy". Family Search. The Church of Jesus Christ of Latter-day Saints. 2016. Retrieved 2016-10-02. ^ Luo, Shiyu; Valencia, C. Alexander; Zhang, Jinglan; Lee, Ni-Chung; Slone, Jesse; Gui, Baoheng; Wang, Xinjian; Li, Zhuo; Dell, Sarah (2018-11-21). "Biparental Inheritance of Mitochondrial DNA in Humans". Proceedings of the National Academy of Sciences. 115 (51): 13039–13044. doi:10.1073/pnas.1810946115. ISSN 0027-8424. PMID 30478036. ^ Roberts, Michelle (2016-09-27). "First 'three person baby' born using new method". BBC News. Retrieved 2016-09-28. ^ Barroso Lima, Nicholas Costa; Prosdocimi, Francisco (2017-01-27). "The heavy strand dilemma of vertebrate mitochondria on genome sequencing age: number of encoded genes or G + T content?". Mitochondrial DNA Part A. 29 (2): 300–302. doi:10.1080/24701394.2016.1275603. ISSN 2470-1394. PMID 28129726. ^ Tyagi, Suchi; Pande, Veena; Das, Aparup (2014-02-19). 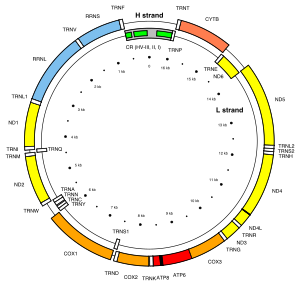 "Whole Mitochondrial Genome Sequence of an Indian Plasmodium falciparum Field Isolate". The Korean Journal of Parasitology. 52 (1): 99–103. doi:10.3347/kjp.2014.52.1.99. ISSN 0023-4001. PMC 3949004. PMID 24623891. ^ Falkenberg, Maria; Larsson, Nils-Göran; Gustafsson, Claes M. (2007-06-19). "DNA Replication and Transcription in Mammalian Mitochondria". Annual Review of Biochemistry. 76 (1): 679–99. doi:10.1146/annurev.biochem.76.060305.152028. PMID 17408359. ^ Ojala, Deanna; Montoya, Julio; Attardi, Giuseppe (1981-04-09). "tRNA punctuation model of RNA processing in human mitochondria". Nature. 290 (5806): 470–74. Bibcode:1981Natur.290..470O. doi:10.1038/290470a0. PMID 7219536. ^ Hogan, C. Michael (2010). "Mutation". In Monosson, E.; Cleveland, C. J. Encyclopedia of Earth. Washington DC: National Council for Science and the Environment.